Our 5 senses are so important to our every day life. We use them all without even knowing it. 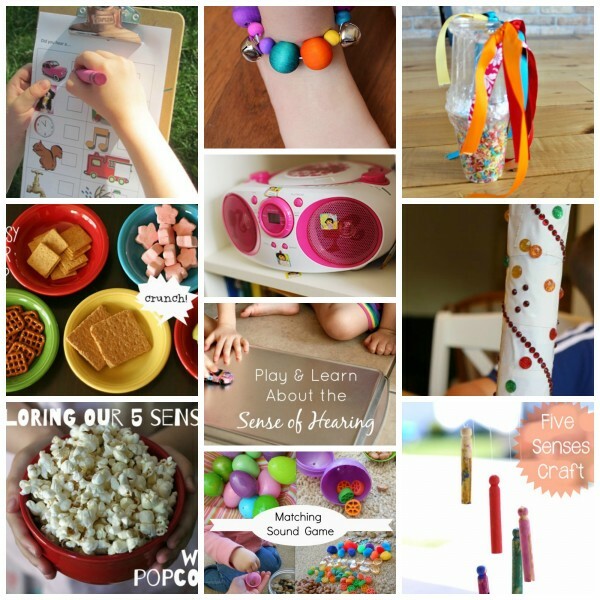 Let’s help teach our kids more about these 5 senses of ours with these crafts and activities that are easy, fun, and educational! We’ve been sharing ideas for exploring our 5 senses over the last few weeks: taste, touch, smell, hear, and sight! We also have some 5 senses book picks, and how to host a 5 senses popcorn party! 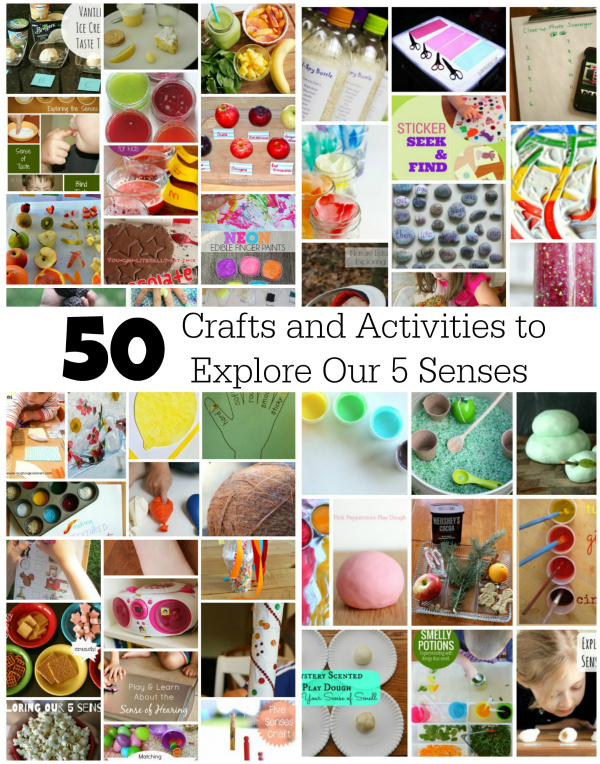 To help you celebrate even more, here are 50 Crafts and Activities to Explore Our 5 Senses! 1. Pink Peppermint Play Dough: Kids will love playing with and smelling this sweet pink peppermint play dough. It smells divine! 2. Exploring Sense of Smell: This sense of smell activity is so much fun for kids of all ages. Use everyday household items to experiment with. 3. Smelly Potions: Experiment with things that smell by mixing up some smelly potions. Your kiddos will love this activity from Picklebums. 4. 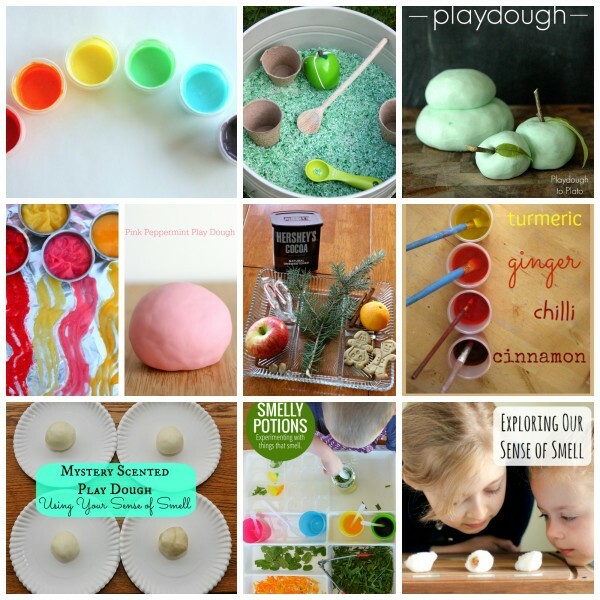 Mystery Scented Play Dough: Challenge your kids to identify the different smells of these mystery play dough samples from Still Playing School. 5. Homemade Spice Paint: Paint pictures with these strong smelling spice paints from Nurture Store. It will boost your senses! 6. The Scents of Christmas: Explore the science of smell by learning about the different scents of Christmas. This activity from Edventures With Kids will bring back all kinds of holiday memories. 7. Scented Edible Finger Paint: These paints from Fun at Home with Kids are pretty, scented, and edible! Perfect for little baby and toddler fingers to play with. 8. Green Apple Playdough: You only need two ingredients to make this amazing smelling playdough. Get the recipe from Playdough to Plato. 9. Apple Cinnamon Scented Sensory Rice: This deliciously scented rice will provide hours of sensory playtime for your children. Get the instructions from The Imagination Tree. 10. Starburst Paint: This sensory paint is SUPER colorful and smells absolutely delicious! Just like Starburst candy. Find the recipe from Learn Play Imagine. 11. Textured Finger Paints: Explore the sense of touch with these awesome textured finger paints. 12. Coconut Senses Activity: Use your sense of touch to learn about the texture and shape of coconuts from Fun-A-Day. Coconuts are hairy! 13. Balloon Senses Game: Fill balloons with different objects and see if your kids can guess which is which. This is a great sense of touch activity from Momtastic. 14. Nature Sensory Bag: Squish around flowers and other plants in this nature sensory bag from Hands On As We Grow. 15. Sense of Touch Craft: Teach your kiddos about the different touch sensations (sticky, smooth, rough, soft, etc.) with this easy craft from New Hope International School. 16. Lemon Craft: These lemons feel like real lemons after you’re done crafting them. Super cool sensory project from Broogly. 17. DIY Sensory Board for Babies: Your little babies will be so entertained and amazed with this DIY sensory board from Laughing Kids Learn. 18. 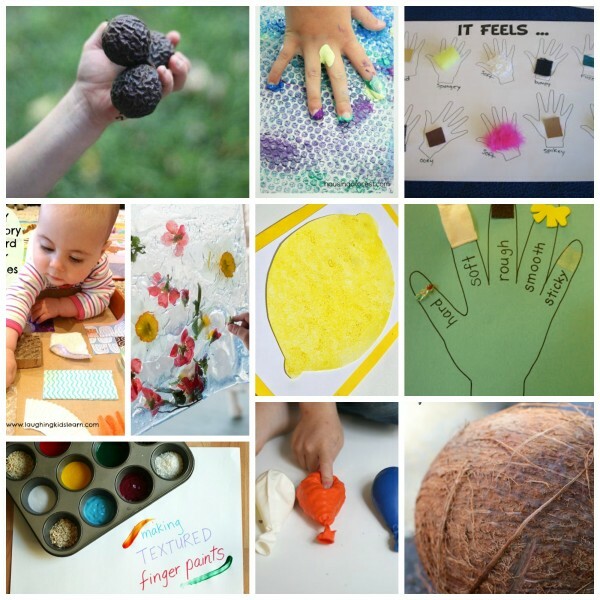 “It Feels…”: Use 10 different materials for this activity and have your kids identify each one with their sense of touch. Get the instructions from Some of This & Some of That. 19. Touch Painting: Housing a Forest shows us how to create a fun tactile painting experience for our kiddos. 20. 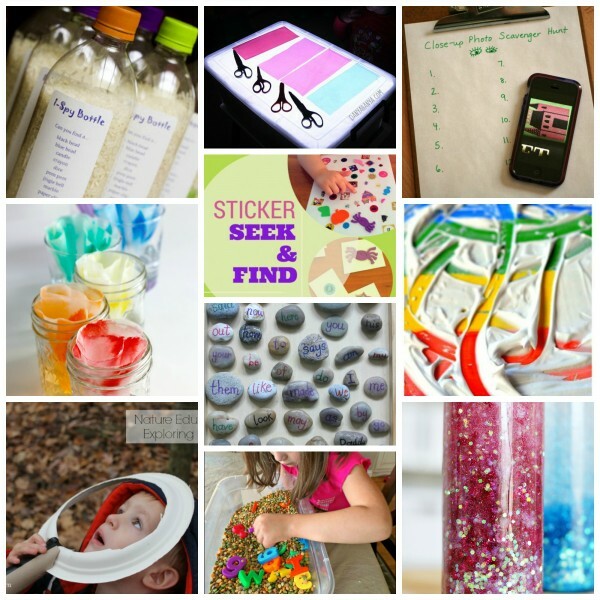 Outdoor Scavenger Hunt: Get your family together to go searching for different textures. Hands On As We Grow has the details for this activity! 21. Green Smoothie Guessing Game: Blend up some green smoothies and see if you kids can taste the different ingredients. 22. Vanilla Ice Cream Taste Test: Can your kiddos guess which brand of vanilla ice cream is which? Try this experiment to find out! 23. Lemon Foods Taste Test: Test your kids taste buds with this fun lemon foods activity from Fantastic Fun and Learning. 24. Fruit Sensory Bin: Kids will love trying and tasting different kinds of fruit in different forms. Get the idea from Kids Play Box. 25. Apple Taste Testing: Explore the many flavors of apples with this taste testing activity from Gift of Curiosity. 26. 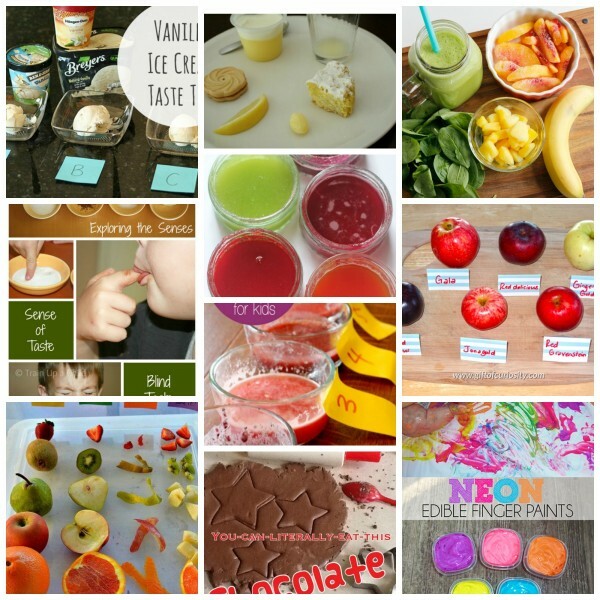 Neon Edible Finger Paint: Let your toddlers go crazy with these edible finger paints. They will love getting messy and using their taste buds at the same time. Get the details from I Heart Arts N Crafts. 27. Fruit Smoothie Taste Test: Make a rainbow of fruit smoothies and try all the different flavors. Get the recipes and tutorial from Hands On As We Grow. 28. Edible Jello Finger Paints: These finger paints from The Imagination Tree are edible, easy to make, and taste really yummy. Your little ones will love learning about their taste buds with these. 29. Chocolate Playdough: This playdough only requires 2-ingredients and it’s no-cook! Teach Me Mommy has the recipe. 30. Blind Taste Test: Conduct a blind taste test for your kids to try foods that are sweet, savory, sour, salty, and more! Learn Play Imagine has the instructions. 31. Photo Scavenger Hunt: Put your eyesight to work with a scavenger hunt around the house! 32. Rainbow Marker Coffee Filter Experiment: Watch white coffee filters change different colors with this colorful experiment. 33. Glitter Sensory Bottle: These glitter sensory bottles from See Vanessa Craft are a perfect activity for quiet time. Kids will love watching the glitter in the water. 34. Nature Education: Get outside with DIY “noticers” that help little ones focus in on certain objects around them. Get the details for this activity from How We Learn. 35. DIY Sticker Seek and Find: This sticker seek and find activity will help process your children’s visual skills while having lots of fun! Get the instructions from Left Brain Craft Brain. 36. Sensory Word Hunt: Teach your kids literacy skills with this fun word hunt game and activity from Mess For Less. 37. Rainbow Writing: Make this easy and colorful rainbow writing activity from Kids Play Box. This is a fun way to learn writing skills. 38. I-Spy Bottles: Hide different objects in a bottle with rice to make these fun I-Spy bottles from Because I Said So. 39. Sight Word Pebbles: This sight word activity is perfect for beginner readers. The Imagination Tree has the details for this project. 40. DIY Light Table: Make your own quick, easy, and inexpensive DIY light table with this tutorial from Danya Banya. There are endless sense of sight activities to do with this light table. 41. Noisy Snacks: You’ll have lots of fun crunching a variety of foods and rating them from quietest to loudest. 42. Popcorn Party: Listen to all the popping that goes on while you cook the popcorn for this “snacktivity”! 43. Clothespin Wind Chime: Make this beautiful wind chime from B-Inspired Mama to practice your sense of hearing! 44. Sound Game: Match the different sounds in these Easter eggs for a fun sensory game from A Mom With a Lesson Plan. 45. DIY Rainstick: Your little ones will really enjoy making their own rain sticks to dance around the house and listen to the rain. Get the instructions from School Time Snippets. 46. Sense of Hearing: Explore the sense of hearing with this play and learn activity from Fantastic Fun and Learning. Use toy cars and different textures to make different sounds. 47. Freeze Dancing: Have some fun by dancing around the house with this freeze dancing activity from Learn Create Love. This is a great way to use your sense of hearing. 48. Rhythmic Shaker: These DIY shakers form Teach Preschool are perfect for a playgroup activity. Shake them all day long to hear the different sounds they make. 49. Jingle Bell Ankle Bracelet: Make some beautiful music with these fun DIY jingle bell ankle bracelets from Two Daloo. 50. Listening Walk: Head outside with your kiddos for a educational listening walk around the neighborhood. They can check off the things they hear with this printable from Teach Preschool. Don’t let the learning stop this summer. All of these activities are super fun and your kids will learn so much!